I recently obtained this antique shaker sewing basket from a Maine auction. As you can see, it was/is in pretty bad, but at the same time, pretty good shape. Although the auctioneer insisted this was a Shaker sewing basket, I am inclined to disagree. The use of the brilliant egg-plant color and the carved wood rims, and an even more obvious "clue" is the lashing ending / beginning as seen in the below photo below - NOT Shaker), leads me to believe that this is in fact an antique Native American Indian basket - most likely from one of the tribes in the Northeast United States. Almost all of the weaving was intact and unbroken. The basket rims, however, as seen in the photograph, have two areas of broken rim lashing. One area is quite significant. The previous owner had sewn a red fabric over the original white fabric covered basket rim on one of the smaller sewing notions baskets. Also a navy blue & white poke-a-dot fabric was used a pin cushion. Surprise! In the added pin cushion I found two rusted sewing needles - one broken in half. The larger rectangular sewing notions basket was also covered in this contemporary red fabric. I see no evidence that it had a white fabric rim cover originally, but I would assume that it did. The red fabric was torn, dirty and rotting and literally fell off in my hands. 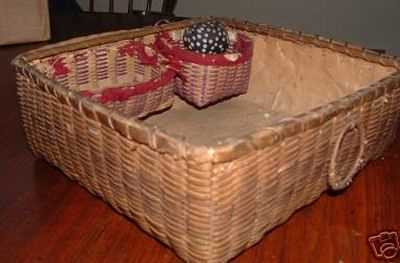 The previous owner also had sewn in an up-side-down paper bag 'liner' into the basket, which was dirty and torn. This was also removed, revealing the lovely original dyed ash trim, which also matches the two sewing notion baskets. 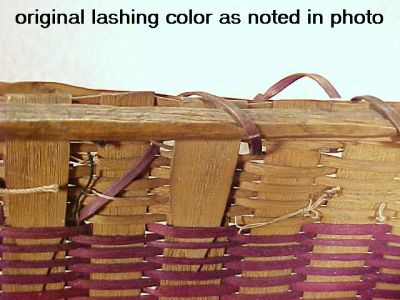 I've determined that the original color of the lashing was the same deep egg-plant color as the weaving; therefore, I will also used a long piece of dyed ash splint to re-lash the rims, leaving as much of the original lashing in place as I am able. Once this Native American Indian / Shaker sewing basket has been completely restored to its original condition, I will offer it for sale here at Simply Baskets.